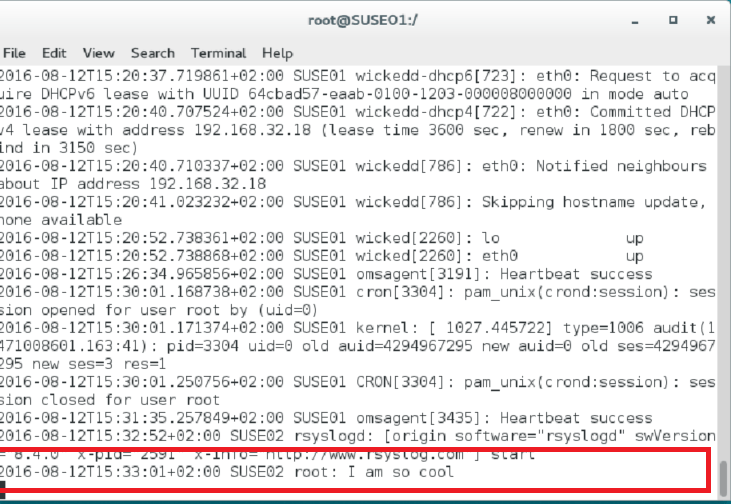 As you know OMS can receive syslog messages from its Linux agents. Well this is nothing special anymore, but there might be use cases where you cannot install a Linux agent or you might have some network devices which need to send syslog messages to OMS because you want to do some deep inspection of the data. How would you handle such situation? Well, one way would be to configure a centralized syslog server. 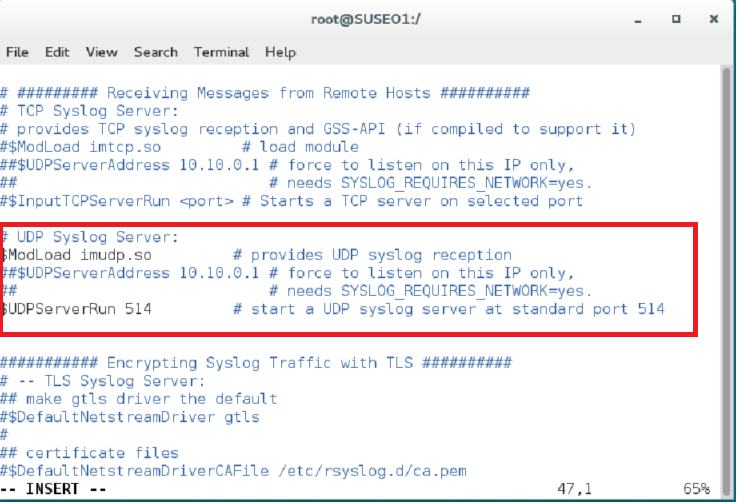 This means you “promote” a Linux server as syslog server and this will be the “target” node for the other devices / systems. After that, configure the surrounding systems to “shoot” their events to the syslog server. I will show you how to do that in this demo. I have installed two Linux systems, SUSE01 and SUSE02. SUSE01 is acting as syslog server, collecting all the events and sending it to OMS. SUSE02 is configured as “client” which will send the events to SUSE01. How did I do that? Let’s see first we will configure SUSE02 (client). I will not show you how to install Linux nor how to install the OMS Linux agent, because there are enough posts on the internet. Make sure your firewall is also configured for the required ports. 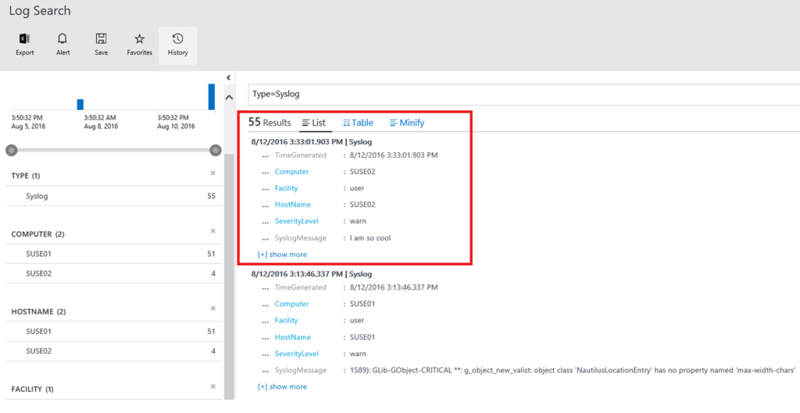 First you need to prepare your OMS workspace. In OMS you need to configure what facility you would like to get into your workspace. Make sure you configured your workspace, where you have your agent connected to, according to your need. If you need help, check this article here. In my case I added user and local7 facility to my workspace and deployed it to my agents… After that, we are ready to configure SUSE02 (client). There is only one file you need to configure to send the events to a remote computer. 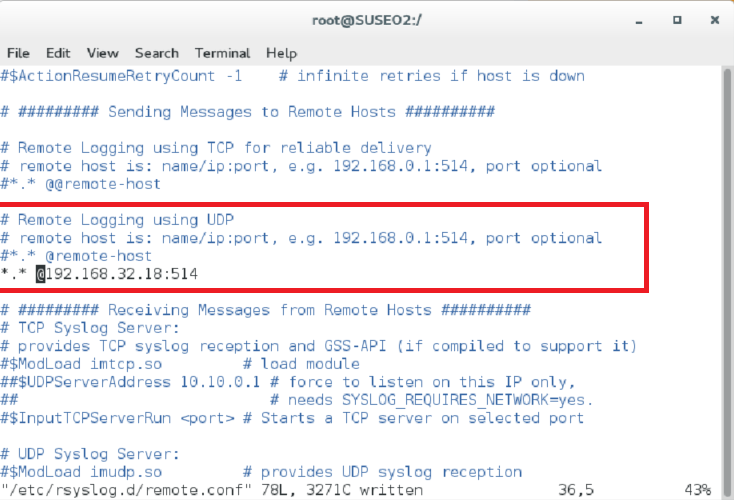 Uncomment the line above and set the IP of your syslog server. In this case it is 192.168.32.18 depending on your requirements, it is also possible to send the messages via TCP which is a more reliable way of sending a large amount of events. We are using for demo purposes only UDP port 514. Now we are going to configure SUSE01 (syslog server). Now we are ready to fire some test events. On SUSE02 we run a test command…. This is one way how to get syslog data from all sorts of devices into OMS. Cool!